Google has added the Dark Mode feature to several of its Android apps this year. One reason is to prevent the brilliant white background of Android’s Material Design from blinding users. Another reason is that Android models with AMOLED panels save a lot of battery life when Dark Mode is enabled. For those unfamiliar with Dark Mode, this UI setting flips the usual screen set up of dark text on a white background to white text on a dark background. During this week’s Android Dev Summit, Google told those developers attending that adding a Dark Mode to their apps will result in extreme battery life savings. A chart displayed by Google at the event shows that at 50% screen brightness, YouTube in Dark Mode consumes 14% less battery life than when the app is in normal mode. At 100% brightness, the battery consumes 60% less battery power using Dark Mode. Another chart projected by Google showed that in regular mode, a screenshot of Google Maps at maximum brightness consumes 250mA of battery power on an AMOLED screened Pixel handset, compared to 230mA of battery power used on an LCD-screened Apple iPhone 7. But in Dark Mode, battery consumption on the Pixel drops 63% to 92mA. 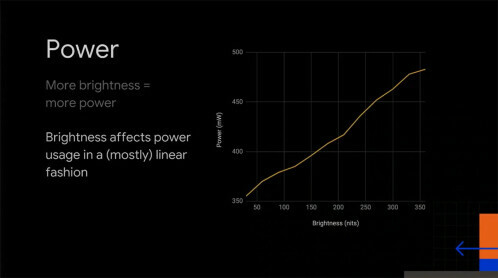 Another chart shows that a 2016 Pixel, with the screen at at maximum brightness, consumes approximately 330mA of power compared to approximately 60mA of power with the display set at maximum black. AMOLED displays do not require the use of a backlight, unlike LCD panels. Thus, with an AMOLED screen, a black color simply means that none of the red, green or blue pixels are turned on. That not only saves battery life, it means that the contrast is sharper when reading text on a black background with an AMOLED screen. Google is partly to blame for designing so much white into its Material Design. But it is trying to help save eyes and battery life by offering Dark Modes on many of its apps, and that trend will continue. There are many Android users, like yours truly, who love the look of Dark Mode even under well lit conditions.